Remember when I said that I would never run a marathon? Remember when I ran my first marathon and said that I would be one and done? Yeah, its about time you stop listening to what I say. If someone convinces me to enter a race, I cannot resist the temptation. And that is how I wound up running the 2015 Dopey Challenge, which capped off 4 consecutive days of running with the granddaddy of them all: the 2015 Walt Disney World Marathon. 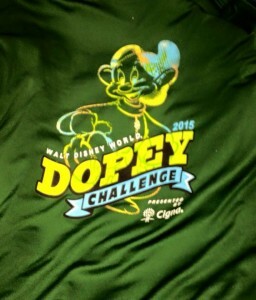 The event shirt logo for the Dopey Challenge. I don’t want to repeat ground we’ve already covered, so please check out my recaps and reviews of the first 3 legs that made up the Dopey Challenge: Pluto’s 5k family fun run, Minnie Mouse’s 10k race, and Donald Duck’s Half Marathon. Like the two previous races, we received a Champion long-sleeve tech shirt with the event logo. Like the others, this is a nice quality shirt and the logo and quality are up to Disney’s usual high standards. The shirts are available in both men’s and women’s cuts, which is nice to see. 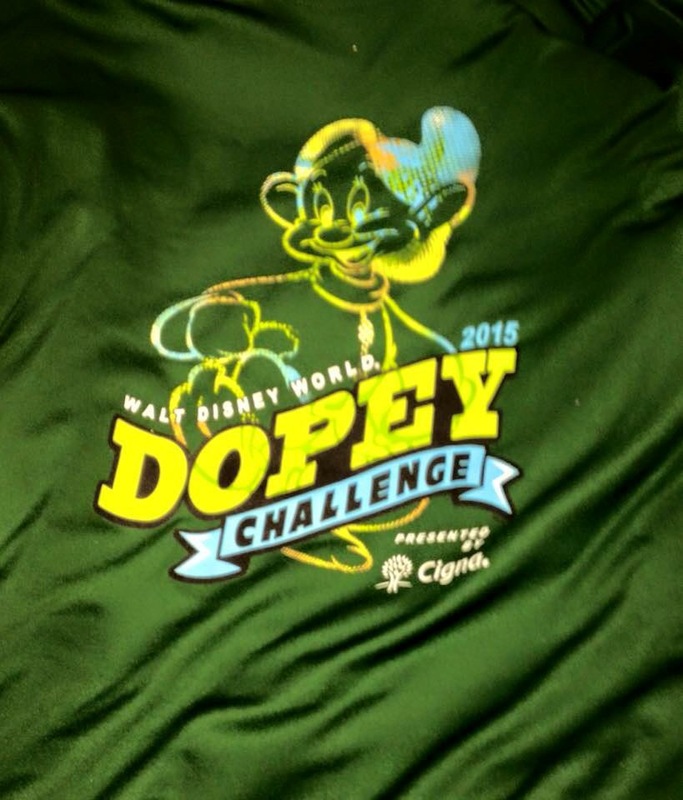 My only suggestion (and please do not take this as a complaint), is that runDisney try to mix in some more short sleeve shirts as I received 5 long sleeved shirts for running the Dopey Challenge. I wore my now-traditional race kit, which included Layer 8 running shorts, a SweatVac race hat, Adidas Climalite compression shorts, C9 wrist bands, and a Reebok dry fit tank top. I grabbed my Yurbud triathlon series headphones and my IPhone 5S, and a Ziploc bag to protect my Iphone. As we spend a lot of time on www.Casual-Runner.com discussing running shoes, I should mention my footwear choices for this Dopey Challenge. When I ran the Dumbo Double Dare back in August, I noticed that on day 2, my shoes were still wet from the previous day’s event. Thus, I knew going into the Dopey Challenge, I would need 2 sets of shoes – which I nicknamed Chip and Dale. Back in October I bought 2 identical pairs of Saucony Virratas, and alternated them during my fall and winter training and races. This allowed me to alternate the pairs, as I used the Chips for the 5k and half marathon, and the Dales for the 10k and full marathon. This ensured that I had a pair of fresh, DRY shoes for each race morning. It also ensured that I would have a backup pair if anything were to happen, like say, accidentally filling one pair with GU mid-race. If I am going to have to fight weather conditions during a challenge series, I’d rather do so for the shorter legs. We were fortunate, after the cold conditions earlier in the weekend, to be rewarded by near-perfect race conditions on marathon morning. It was a little on the cool side, so trash bags would once again be the fashion of the day at the pre-race area. 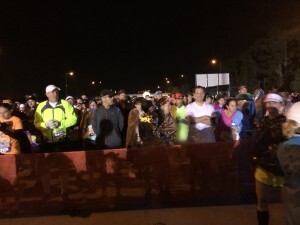 The pre-race was pretty much a clone of what we experienced the day before at Donald’s half marathon [LINK], which is to say everything ran efficiently and smoothly. Also, to runDisney’s credit, they do swap out the branding for the respective events, so most of the signage was new, which is a nice Disney touch. Corralled runners eager to get the race under way. I would like to spend a moment to discuss my race plan, as this would be the 4th consecutive event day for me, and the first time I had ever attempted running an event – let alone a full marathon – the day after completing a half marathon. The mantra of the Dopey Challenge is “survive and advance.” You should not to try to set the world on fire with split times, rather your goal is to finish every race upright and save something in the tank for the next day. Those who do not heed this cautionary tale end up regretting it. I had taken it very easy during the 5k, walking most of it. During the 10k I forced myself to slow down, but still felt as though I had overdone it a bit more than I intended, but was still within a safe margin. During the half marathon I really slowed it down and took lots of photos and videos (please check out our YouTube video), but I noticed that all of the stopping and restarting was actually too much for me, and I found myself lagging during miles 8-10.5. Thus, my plan for the marathon would be to minimize the stopping (which unfortunately means less pictures and videos, my apologies), and to treat the first half like I would a half marathon, albeit at a slightly easier pace. I would walk all of the water stations to ensure proper hydration, and stop when I needed to for the restroom (sorry, minor TMI alert), but otherwise push through, complete the first 13.1 miles, and survive the second 13.1 the best I could. 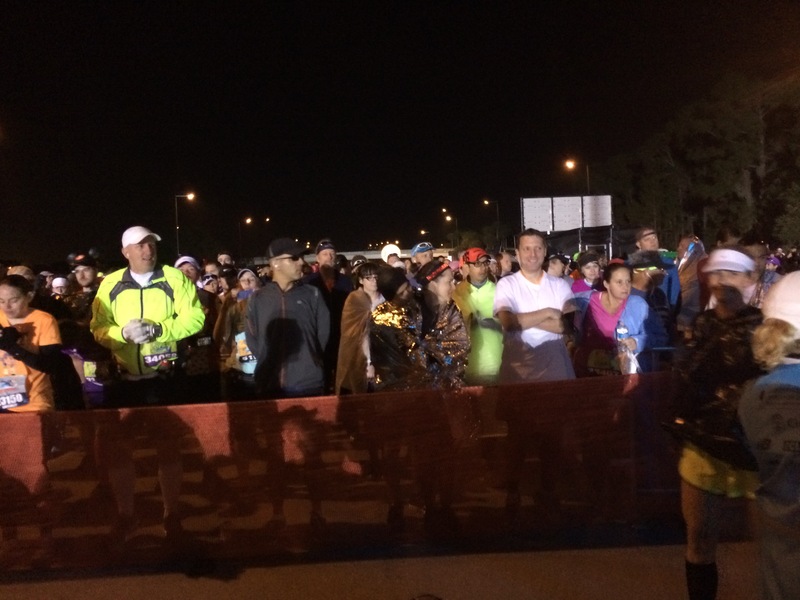 Also, I would do my best to AVOID any on-course collisions a la the 2014 Walt Disney World Marathon. I cannot omit 2 special moments that I was looking forward to on the course. First, my friend Amy, who unfortunately had to withdraw from the Dopey Challenge due to injury, demonstrated the amazing fortitude of a Casual Runner by overcoming her own disappointment to get up early and support her friends on marathon morning. She told us she would be waiting for us in the Magic Kingdom. Additionally, Jennifer and Jake, who had finished their weekend races (but were by no means done as they still had 2 more runDisney events to go later in the week), told me that they would be waiting for me in Epcot. I gave them my 5k, 10k, and half marathon medals, as I intended to finish the Dopey Challenge with all of my bling. These are the kinds of special touches that really make runDisney event magical, and even more so when they are shared with great friends. 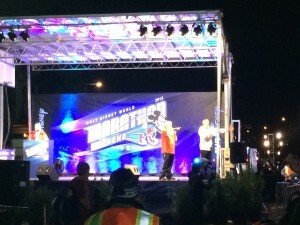 The stage was set – literally – for the 2015 WDW Marathon. So that was it. I had my race plan, and it was time to load into the corals, wait for the customary fireworks, and hope it all held together over the next 26.2 magical miles. The start of the race was more than I expected. Why do I say that? This being my third marathon in a year, I expected to be less anxious, but I was nonetheless excited and a bit emotional. The reality is, every time someone toes the line at an event, it is a big deal for them, as we all have our own stories and motivations for running. And, for me, the thought of taking on a challenge of the magnitude of 26.2 miles, especially on the heels of having run 22.4 miles over the previous 3 days, this was a big deal and meant a lot to me. Unexpected Magic. I am skipping ahead a bit, but as I was running through Frontierland (right around mile 6) in the Magic Kingdom, I saw a fellow runner who was already struggling. We talked, and I told her that, on this day, “failure was not an option.” I saw a smile grow on her face, and she remarked “that is the best advice I have ever received while running.” And so it would come to be on that day, that failure would not be an option. The first 7 or so miles of this race are identical to the corresponding miles in the Walt Disney World Half Marathon, right down to the same entertainment and bands (yes, I still appreciated and loved the high school bands, those kids were impressive especially given that I knew this was THEIR second consecutive early morning cheering on the runners. Unexpected Magic. During the first mile I fell into step with a woman who could not have been friendlier. To my surprise, she remembered me, both from Casual Runner and from the 2014 Erie Half Marathon at Presque Isle. She and I had run a few miles of that race together and we discussed that we would be running Dopey, and has it turned out, we happened to meet up on the course. It is amazing how fate and chance can be sometimes to run into the same person, in two different races, on two different courses, 4 months and over 1,000 miles apart. But this would not be the last time that fate and chance would smile upon me on that day. As the 2015 course was identical to the 2014 marathon course, please check out my review of that race (Part 1 and Part 2) and I will try not to repeat myself too much, but rather highlight some of the unique experiences on this great day, which includes the amazing enthusiasm of the volunteers and fans. I do not know what it was about this day, but the pockets of on-course support that were scattered throughout were particularly noteworthy on this day, and I needed it as I fed off the enthusiasm of the volunteers and the fans to keep me going. Race Icon: There is nothing else quite like a stroll up Main Street USA during a runDisney event. By the time we passed the WDW Speedway (my 5k point), the elite runners had already made their way through and the A corral runners were making their lap around the track. The crowds at the Ticket and Transportation Centre were even larger than they had been the day before, and they needed no encouragement to cheer us on. Nor did the DJ on the top of the water bridge who was his usual rambunctious self – and you can’t forget the giant Mickey hands. Race Icon. 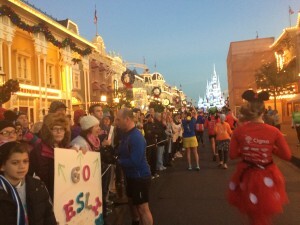 As we made our way towards the Magic Kingdom – for my 2nd time in as many days and my 4th time in a runDisney event, I noticed that it was no less magical. The same excitement and reverence I experienced before overtook the flowing sea of runners as we made our way into the backstage area, where we could see Cinderella’s Castle, all aglow in the Christmas Dream Lights. We took a collective deep breath and emerged into Town Square where the crowds welcomed us, and more than few tears were shed. I don’t feel as though I can do justice to this moment, you really do have to experience it for yourself. Race Icon. We made the turn onto Main Street USA, and were rewarded with yet more enthusiastic fans and Cinderella’s Castle, in all of its spectacular early morning glory. What a sight it is to behold. Unlike the day before when i walked, I ran this entire length in accordance with my race plan. Stayed on the left and high-fived as many spectators as I could, and kept an eye out for Amy. I was rewarded as I saw her on the Hub, and stopped to say hello, give her a very sweaty hug, and thanked her for coming out to cheer me and our other friends on, it really meant a lot to me. With that I took off towards Tomorrowland. During the 2014 WDW Marathon, I had some, well, TMI issues. So I made sure to build some preemptive stops into my race plan for this year, just in case. If you are planning on running this race, be advised that the bathrooms in the theme parks are open for your use, so take advantage of them! There are 2 sets of bathrooms in Tomorrowland, and 1 each in Fantasyland and Frontierland that are easily accessible for runners. I took advantage of this and was quickly back on my way. We approached Cinderella’s Castle, which, I must admit, I do miss the heralding trumpets playing on the balcony, but it was no less magical. Race Icon. This never gets old: running through Cinderella’s Castle and emerging out into the Hub and looking down Main Street USA is one of the highlights of any running event anywhere in the world. (Check it out in our YouTube Video). A quick stroll down the ramp, and then a right turn took us into Liberty Square, along the Rivers of America, past Pecos Bill’s and Splash Mountain, where the Walt Disney World Steam Train was there to toot its whistle and wish us well. We exited the park and entered the backstage area behind Splash Mountain where the next hydration station and bathroom stop awaited us (you can tell what I think are very important during marathons!). Some times in a race, this is all you need to keep in mind. We made our way onto the back roads of Grand Floridian Way, where I noticed something: while runDisney does an excellent job of promoting the race challenges before and after the races, they don’t celebrate them during the races themselves. This would be a welcome opportunity to celebrate when you are, for example, half-way done with the Goofy challenge, or half-way done with the miles of the Dopey Challenge. Hint hint runDisney! I did not find the congestion in “Cone Alley” to be bad at all on this day, and found myself in a sea of Goofy Challenge bibs. Not sure why, but I found this remarkable at the time. We made our way past the Grand Floridian (Mary Poppins, Bert, and the Wedding Chapel tuxedo men were there), the Polynesian Village Resort, the golf courses (Donald Duck was there), and down the road on our way to the Speedway (the Genie from Aladdin was there). We entered the Speedway, which is fun as it introduces interesting terrain changes to the course, which I appreciated. Entering it requires a noticeable downhill followed by a climb and immediately into a 180-degree left turn. As I was on the inside, I reached out to the pile of tires on the corner to assist in my turn, which barely required me to extend my arm. Despite this, an older gentleman burst through the all-too-small gap, forcibly pushing my arm out the way and yelled “move it!” This was decidedly unmagical, but you can’t expect all runners to be Casual Runners, or courteous! 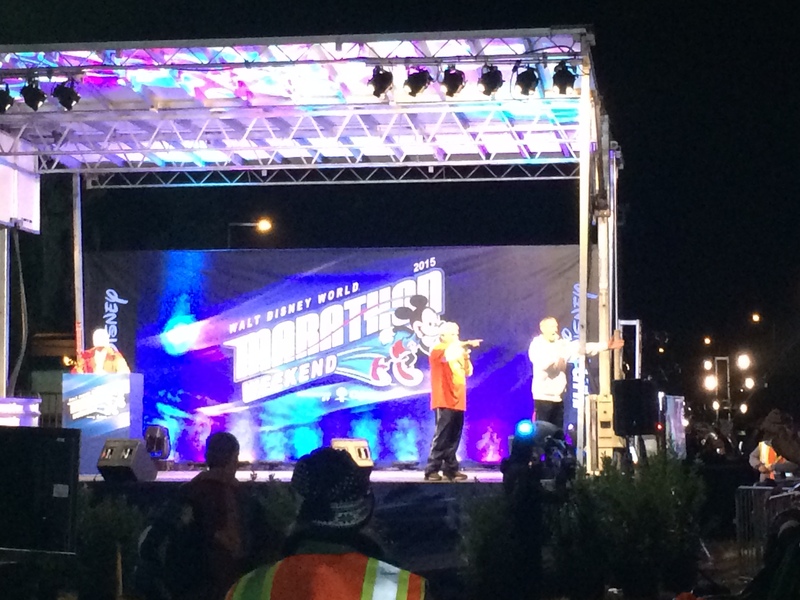 The Speedway was much more enjoyable than it was last year, especially because they had plenty of restrooms throughout (seriously, you should check out my 2014 recap), so props to runDisney for greatly expanding the number of on-course restrooms this year. We made our loops around the Speedway as we could see the sweepers cleaning up the first part of the course and reopening the roads for the park guests. We exited out over a somewhat muddy grassy area, and made our way onto Bear Lake Road, a stretch of Disney property not usually open to guests. Unfortunately, this is where we have to stop for today. But here is the fun and surprising conclusion to this review. 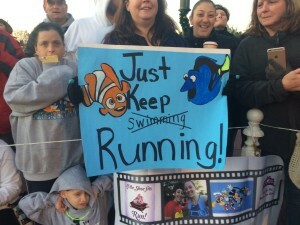 Do you want to experience more from the 2015 runDisney Walt Disney Marathon Weekend? Check out our event videos on our YouTube channel. Pingback: The VISION EIGHT TEAM for him & her | The Best Sock You'll Ever Wear-Guaranteed.